Arte Povera is an artistic movement that originated in Italy in the 1960’s, combining aspects of conceptual, minimalist, and performance art, and making use of worthless or common materials such as earth or newspaper, in the hope of subverting the commercialisation of art.To begin this project I decided to look into a few books at the library based on sculpture and creativity in general as it was a project which was way out of my comfort zone but I wanted to give it a good try. I tried selecting out the recommended readings but they had all been on loan and although I had taken out three books including one on Germano Celante and Eva Hesse none of them had really related to how I could approach this topic until I read a small book called ‘It’s not how good you are, it’s how good you want to be’ by Paul Arden. From this I found motivation to explore and develop without being afraid of failure and there was a quote from Samuel Beckett that said “Fail, fail again. fail better.” Which inspired me to just go out and see what happens. My idea sparked pretty quickly after reading that book and on my way home for lunch I was walking up a lane where there is a half painted rock. It always intrigued me because it was so obscure and it got me thinking: Why has someone painted this rock? Why is it half painted? What meaning is behind this? Who? Why in that place? I reflected on my tutors lecture and how there was an instalment/sculpture piece of what appeared to be just chairs placed in a communicating way but, were actually chairs from a prison where families may have come into contact with criminals and this added more depth and meaning to a seemingly blank looking piece that was created by Sandra Johnson. During my tutors slide show presentation there were also pebbles that were in formation purposely or maybe not on purpose but it still reminded me of the half painted rock. After this I decided that I could paint pebbles/stones in correlation with how my first month of university has went by using colour. This seems like an idea that couldn’t be done as I would have to remember the first thirty days I’ve been here but luckily I have a diary that I decided to start when I began university to keep my friends back home up to date on what was going on in my life. My thinking process was that I could assemble these pebbles in a circle or in an info graphic formation starting with day 1 (3rd Sept) to day 31 (3rd Oct). I would paint some pebbles red to represent bad days, amber to represent average days and green to then represent good days. 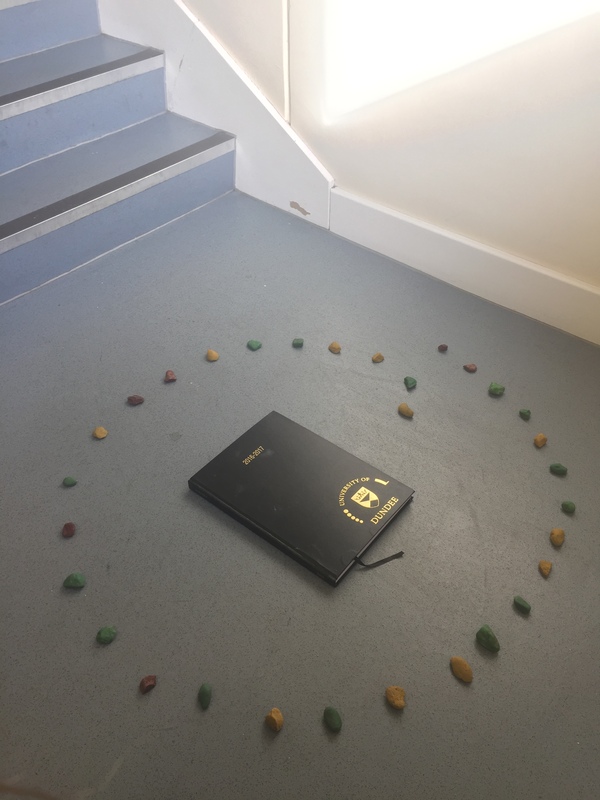 After this I’d then incorporate my diary into it by placing it in the centre or around the stones maybe wrapping it up so no one can see exactly what is happening but that the pebbles give a glimpse into how university life is going without having details. I felt it related loosely on the earlier artist that my tutor had mentioned due to it looking like a plain or irrelevant piece which actually has a much deeper purpose than what meets the eye. I began going through the month and listing off the dates and writing good bad or average beside each one in total it came to 14 good days, 11 average days and 6 bad days so its been a pretty good month! Artist research was important for my sculpture project due to the fact I wanted it to be relatable and link accordingly with Arte Povera. One of the first artists I came across was named Richard Long and I looked into two of his sculptures; Connemara sculpture and Six Stone circle (1982) the latter is ” a balance between the patterns of nature and the formalism of human, abstract ideas like lines and circles. it is where my human characteristics meet the natural forces and patterns of the world.” As an artist he creates his work by merging with the environment and disrupting it using natural materials e.g. slate. All of his work is constructed following his completion of a carefully documented walk in a landscape and similarly I am using my own personal documentation of my first month of university and a new place to construct a sculpture. Martin Creed was another artist I did some research on for this project due to the fact some of his work was based on info graphics. Most of his pieces are named by number and what particularly stood out to me was No.701 (pictured below). I read an article of his work at Hayward Gallery, London posted on The Guardian in February 2014 titled ‘What’s the point?’ and the point is that his work comes and goes and that his pieces are usually a good idea at the time but you are often left looking at just the limp memory of that creative moment. It then declares maybe that’s how inspiration and its aftermath always feels. I find this is a good example to link in with my outcome as the sculpture was only temporary and documented and then moved/taken away. His work is ordered simply and numerically and I also aspired to create something simple yet meaningful. Once I began the photographing of my sculpture I decided it would be best placed outdoors due to the natural materials used but also because if I set it in certain areas it would mean more. My first idea was taking pictures of it at the bottom of the stairs towards my flat door as there was a natural light through the window and it was quite inside. I then took it from outside the front door to our block of flats and using various formations including scattered and ordered which then came too my final sculptural pictures.